Intrinsically we are drawn to areas that are falling-apart, rupturing. This human drive is in contrast to notions of a utopian kingdom while our reality is a kingdom in which we are constantly confronted with entropy. Humpty-Dumpty's scenario is relevant now. Still, isn't the image of Humpty cracked into a thousand pieces and being pieced back together much more exciting than him (not her?) as an egg sitting on a wall? At least it gives all the king's men something productive to do. My recent sculptural work deals with entropy of physical materials and of human relationships to the natural world. Environmental mini-apocalypses can shift our value systems and create lifestyles of appropriation that fuse Mad Max with Buñuel. This past year I have made a series of sculptural work, including video, from my research and travels to a space of surreal post-apocalyption; the Salton Sea in southern California. 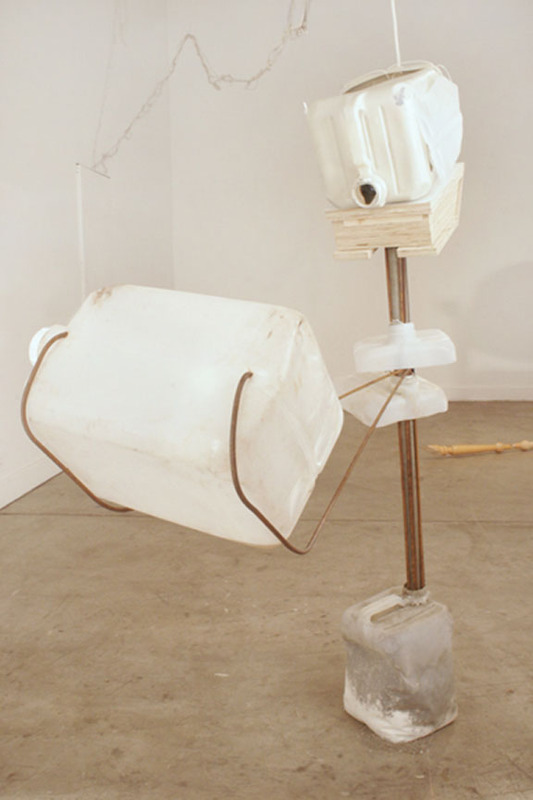 The works comprise collections of fish gills, discarded furniture parts, and plastic oil jugs that fuse together in anthropomorphic forms to piece apart this epic of the environment and of our perceptions of failing, uncontrollable natural systems. Claire Zitzow was born and raised near Richmond, Virginia. She attended Virginia Commonwealth University from 2002 to 2008. There she earned a Bachelor's of Fine Arts from the sculpture department and a Bachelor's of Interdisciplinary Studies with a focus on "intercultural urban studies". In 2005 she received an international travel grant which she used to explore and research the nitrate factories and abandoned housing in the Atacama desert of Chile. In 2006 Claire received a fellowship from the Virginia Museum of Fine Arts, as well as a John Roos Memorial Scholarship. From 2008 until the present, Claire has been at the University of California, San Diego pursuing her master's degree and working on creative projects in the San Diego area. With the help of other graduate students at UCSD, she organized Satellite Ensemble, an ongoing alternative exhibition and workshop program in the San Diego area.